In Turin I have seen the future of art. 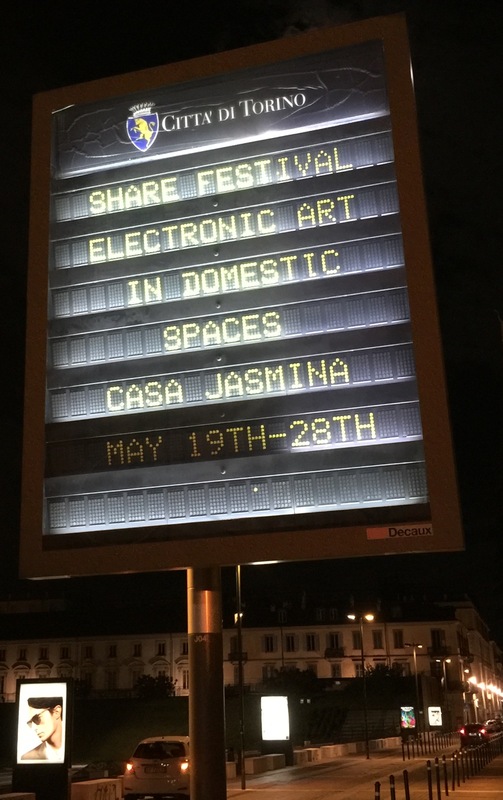 One year ago, Casa Jasmina opened its doors, a showroom for household technology, smart and connected, and open source. I had learned about this project by some remarks of its initiator, Bruce Sterling at earlier occasions. Like many ‘Cyberisti’ of my age, I have been loosely following Bruce’s thoughts for thirty years now. There were always some ideas that I would take for me, to write or talk about, but it was not before his book ‘Shaping Things‘ that I could really work with what he was telling. ‘Shaping Things’ is a small book, more an essay. It is as far as I know the first comprehensive examination of what was really going on when digitalization would leave the confinement of the web and would conquer the realm of physical things to form an ‘Internet of Things’; and he was talking in particular on how digitally enhanced things might still be designed in a benign way, despite their totalitarian nature of global connectedness and allover datarization of human life. With Casa Jasmina, Bruce announced to translate this design theory into the practice of an effectively livable home, that he was going to build together with Jasmina Tešanović, the Casa’s eponym. It is one thing, to write about stuff, a totally different thing to build something in the corporeal world, with all the constraints of the human condition to face. So it is no wonder that the ‘Casa’ I found at the day of its opening celebration was more an echo chamber for our visions and expectations than an actual home. 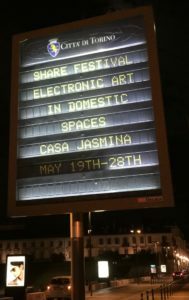 Today, one year later, Casa Jasmina has matured to officially host the Piemonte Share Art Festival. Luca Barbeni who had curated Share.to since its beginings 2006 had moved to Berlin to start his NOME Gallery, and Bruce Sterling stepped in as artistic curator to run the festival in Torino together with its co-founder Chiara Garibaldi, getting illustrious support by MOMA curator Paola Antonelli and astronaut celebrity Samantha Cristoforetti. Bruce would further focus the art exhibition from ‘art post internet’ as such, to domestic art and technology. The ‘Casa’ and its inhabitants are notedly welcoming to guests, and the hospitality we experienced this time was no exception. Art in modernism on the other hand had struggled with domestic life since its conception – most artwork is plainly unsuitable for normal household conditions. And this property it shares with digital technology. Although most people use ‘computers’, formally PC, nowadays smartphones and tablets also at home, these devices have not really become part of our houses’ facilities. Our digital tech is still mostly personal outfits, more accessories than appliences. It is partly the arrogant presumptuousness of both tech and modern art, demanding all attention, defining their apodictic morale, which in my oppinion make both so hard to bear in the limited space of our private quarters. Jasmina Tešanović has argued about this in her vitriolic manifesto ‘The seven ways of the Internet of Women Things’ that we have published on this blog, too. ‘House Guests’ is the title of the exhibition, and thus the project is more about comfortable cohabitation of art, tech, and people, than about art as such. (Therefore I want to postpone my criticism on the artworks to a later article). Video art from seditionart.com displayed on iPads in a frame. Here: Rose Throb by Claudia Hart. On exhibition we see two distinct types of artwork: Physical things and video. 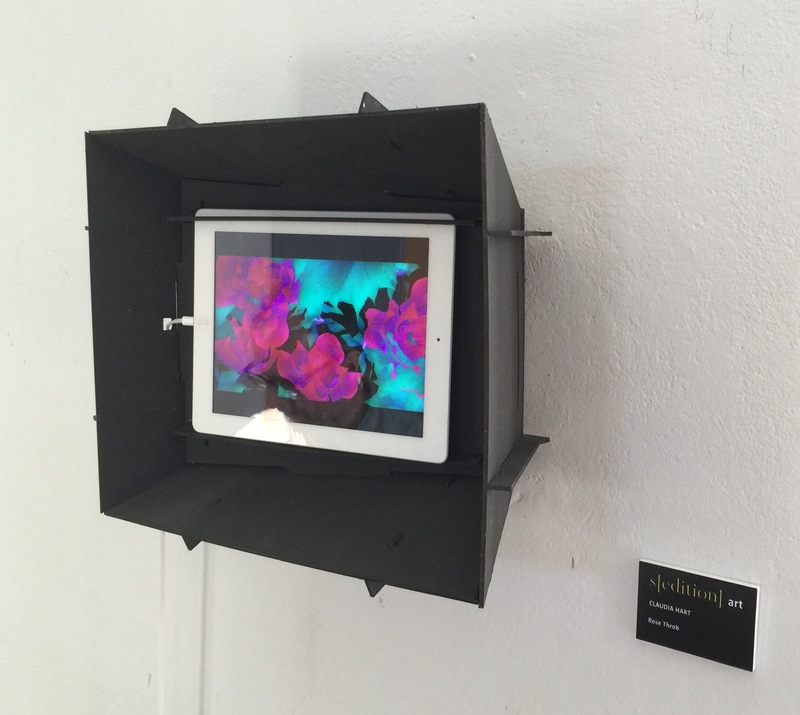 Eight pieces of video art that originate from the online art platform seditionart.com are displayed on wall-mounted white iPads. These eight works are not interactive, but mere video images. So it might seem that they could have been running on a laptop or a beamer, or any kind of digital screen, just one after the other. Instead, the iPads were framed in black ruffs, approximately double the diameter of the screens, resembling the bourgeois tableau painting. The problem with video displays in general, and in particular with mobile screens like the iPad’s is the total dominance of the medium over its content. McLuhan’s observation holds unchanged, that things on TV are primarily television, and secondly, if at all, the content, be it a story, movie or news. This medial predefinition is much less true for paintings, print, or sculptures where the material is just one aspect of a bigger whole. And despite their voluminous collars, the iPads in Casa Jasmina had not lost much of their hypnotic quality. The art they were showing faded under the beautiful hues of the brilliant technology. This pornographic dominance of the medium is clearly an issue with art in the digital age. Compared to the solipsism of the videos, the physical objects were much more about really living with them. 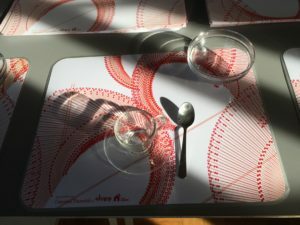 Tablecloth with algorithmic design, plates inspired by the quantified self, musical instruments driven by Microsoft Kinect: All kinds of calm technology, blending in with the maker artefacts that were to be found in Casa Jasmina before. The pretense of Casa Jasmina’s art is little, we don’t get sold an art revolution. While the late Zaha Hadid and her partner Patrik Schumacher would claim parametricism as the next paradigm of architecture, design and even the human condition as such, the objects at Casa Jasmina are rather playing with creative options than providing a grand narrative. 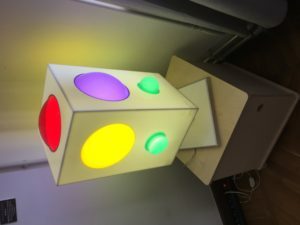 A night lamp in maker design. The art at Casa Jasmina is thus not so much about art but about home. The real art project is the whole Casa, with everything that has been going on inside it from the beginning. As Bruce had proclaimed then: It is about putting human values into technical things. Together with the Arduino-creator Massimo Banzi, Bruce has been advocating for ethical technology, and had recently put together three posits in an IoT Manifesto: Things should be kept open and interoperable. While the standardization of user interfaces in smartphones are a clear advantage of Apple’s products, hardly anybody would want art to be paved down by the paternalistic sterility of the iTunes store. Closely related is second postulate of sustainability. What good is an LED lightbulb that might last for 20 years, if the software that makes it ‘smart’ would be outdated and might even stop its working after two years? Planned obsolescence has been the business practice in Silicon Valley from the beginning. That this is not just eco-babble was impressively demonstrated by Google’s remotely shutting down and bricking their ‘Nest’ devices that were sold before a certain date, to force people buying new ones. The third postulate is fairness. Tech must not to spy on people. I think this can only made possible, if we prevent things from requiring a centralized infrastructure. Only if we manage to build mesh networks of decentralized, distributed, and autonomous devices we will be able to maintain privacy. For many people, contemporary art has long become detached from their lives – intellectually abstract, just the hermetic expression of the artist’s personality, protected by authorship and intellectual property claims – do not touch! Digital technology is mostly withdrawn from our grip. When we open their shiny cases, we void the warranty. Casa Jasmina’s art and technology is open, friendly, easy to live with. One might say that it lacks the grand gesture; it is just comfortable. Maybe this is exactly the point. We will see domestic things with interesting design, that are not just branded signature consumer products, but bespoke and uniquely fit to their owners, demonstrating instead of ellegantly veiling their factitiousness. What we will see is the rise of a new Arts&Crafts movement. Like its predecessor 120 years ago, this neo-arts&crafts will take a stand opposite the slick perfectionism of corporate industrial production, but not by regressing to pre-industrial manufacturing, but by embracing the novel methods and tools of the time. And opposed to the maker movement from which it has spun off, neo-arts&crafts will be less about technology and more about craftsmanship. Art nouveau at the turn of the last century is called Jugendstil or Reformstil in German. The ‘reform’ was about creating a livable environment for people to lead happy and healthy lives. If neo-art nouveau follows similar goals by being open, sustainable, and fair, I am convinced it will prevail. Much more than parametricism and other academic concepts of re-inventing art, it has the potential to become a major paradigm of art post-internet. Now I want to see more of it!